Bolster your Life Safety Code (LSC) survey preparation with these two invaluable books. 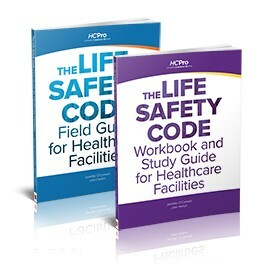 The Life Safety Code® Field Guide for Healthcare Facilities is a portable, concise resource intended to be used on-site for immediate reference, while The Life Safety Code® Workbook and Study Guide for Healthcare Facilities goes in-depth to provide thorough, no-stone-unturned analysis. Ensure your organization’s perfect compliance using the book’s charts, tables, and quizzes. Together, these two books will make an immediate impact on your preparation efforts by providing a hands-on approach for survey readiness, helping you anticipate follow-up actions post-survey, and addressing common workarounds staff must be aware of.